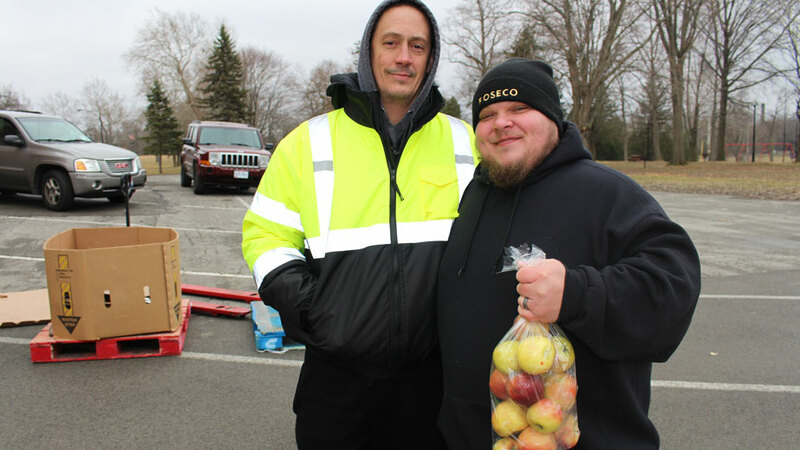 WARREN, Ohio — On a bitterly cold morning in late March, some 500 area residents stood in a line snaking around the Packard Music Hall parking lot, waiting for a chance to bring home some extra food. One of those residents, Erin Sekerak of Newton Falls, was there at 6 a.m. With six people living in her house, the meat, bread, vegetables and pastries she received will help feed her family, she says. That help was made possible by Free Meat Monday, an event organized by the Warren Family Mission and Second Harvest Food Bank. Some 25 volunteers unloaded 40,000 pounds of food from trucks, including boxes of frozen meat, fresh produce and baked goods. When it comes to need in the area, pastor Chris Gilger says the long line speaks for itself. 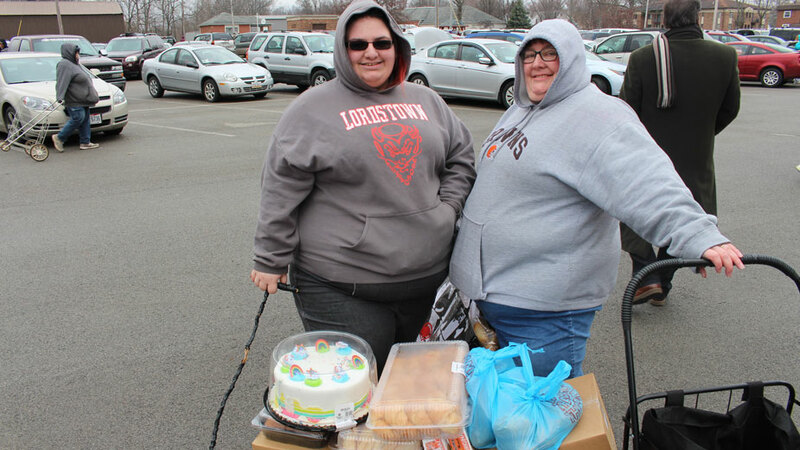 Erin and Diane Sekerak stood in line for hours to get food from the Free Meat Monday drive. “People will stand out in the worst cold to get this food, and that tells you how bad the need is around here,” he says. Gilger is executive director of the mission, which he founded in 1998 after receiving a $100,000 settlement from an auto accident. Last year, the mission served more than 120,000 hot meals from its headquarters at 155 Tod Ave. in Warren and more than 112,000 bags of groceries from its food bank at 1312 West Market St.
Warren Family Mission serves residents from Trumbull and Mahoning counties with its food distribution, says Dominic Mararri, its director of public relations. “As long as they have a valid ID, we don’t turn them away,” he says. More than 500 residents wrapped around the Packard Music Hall parking lot for the food drive. Mararri sees the need every day for healthful food, he says. Whether it’s someone who needs extra help that month or has been unable to work because of sickness or disability, the mission strives to get them what they need, he says. The mission provides its services with a staff of 20, some 40 volunteers and an annual operating budget of $900,000 – all of which is funded by donations and through partnerships, Gilger says. Along with Second Harvest, the 501(c)3 nonprofit receives support from local businesses, as well as from the city of Warren. When the food drives drew too many people for the mission building to handle, the city worked with Packard Music Hall to host the drive there, says Mayor Doug Franklin. Volunteers Richard Ingle and Jason Borror pass out food during Free Meat Monday. Gladys Marie Miller, Warren, says she was in line at the food drive to supplement her groceries at home. She sees some of the biggest need among families with young children, she says. The mission wasn’t always as far-reaching. Through his work for seven years at Rescue Mission of the Mahoning Valley, Gilger came to know the struggles of the working poor, he says, particularly among those who battle substance abuse, something that claimed the lives of a few of his relatives, including his older brother. He started the mission specifically to serve that population, he says. “I wanted to make a way to get people to rehabilitation and then put them on programs to help them,” he says. North-Mar Church in Warren donated a property on Niles Road that Gilger used as his first halfway house for men. After less than a year, he had 22 living there, he says. The year-long program welcomes any man who battles substance abuse or needs a place to stay to get back on his feet. Pastor Chris Gilger started the Warren Family Mission in 1998. 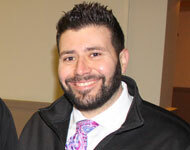 After recovering from addiction, Dominic Mararri joined the mission as director of public relations. Gilger expanded the mission to include women and children in need, opening Hannah’s House for women who are struggling with drugs and alcohol. The house sits on a 15-acre wooded property in Vienna. It has helped hundreds of women in the seven years it’s been operating, he says. The mission’s third property provides housing for homeless women and children who are drug- and alcohol-free, he says. All told, the housing programs have served thousands in the area, providing more than 1,000 nights of shelter monthly. For those who struggle with addiction, Gilger also started Rides 4 Recovery to provide transportation to rehabilitation services. The first step takes them to East Liverpool City Hospital to begin their treatment for four days, after which Gilger works to build their self-esteem by giving them small-job assignments through residential or transitional work programs. A year before starting the mission, Gilger worked as an entrepreneurship teacher at the Northeast Ohio Correctional Center in Hubbard. From there, he’ll quickly get the individual to additional treatment because, he says, “One minute they want help, the next minute their addiction’s pulling them right back into the alley.” Gilger leverages partnerships to secure mental-health or drug-addiction recovery services for individuals, including the Mid-Michigan Teen Challenge in Michigan, where they can stay for free. After treatment, the mission helps those in recovery find housing and work. The organization has given away 27 houses, as well as cars so people can get to work. Six years ago, circumstances were very different for Dominic Mararri. In the early 2000s, Mararri was homeless and battling an addiction to heroin and crack. He typically found himself staying temporarily with friends until legal issues nearly led to him spending time in jail. The charges were dropped, he says, but it was enough of a wake-up call for him to seek help. “I was using drugs and alcohol as a way to fill a feeling I had, a feeling of brokenness,” he says. 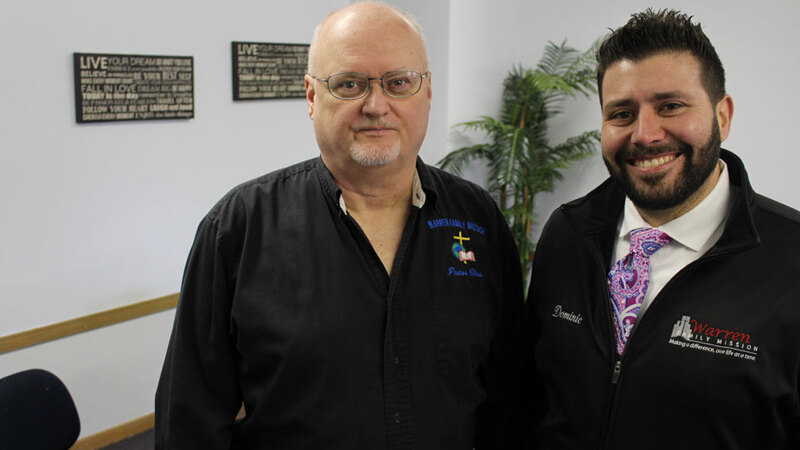 In 2013, Mararri went to the Warren Family Mission where he met its executive director, pastor Chris Gilger, and learned about its Rides 4 Recovery program. He committed to his recovery and Gilger took him to the Mid-Michigan Teen Challenge campus in Saginaw, Mich.
Mararri spent three years at the nonprofit. The organization helps men and women overcome substance abuse through Christian ministry and emphasizes personal growth and constant improvement, according to its website. When he left the program, Mararri wanted to return to Warren and give back, he says. He earned his real estate license and started working as an agent with the Howard Hanna office in Howland. He also received his life and health-insurance licenses and started his own insurance agency, Senior Care Insurance, which specializes in Medicare advisory services. Mararri is currently pursuing his property and casualty-insurance licenses as well, he says. To put his gifts to work for the nonprofit organization that got him on the path to recovery, Mararri works as the director of public relations for the Warren Family Mission. He’s become a vital part of its outreach efforts by organizing events and connecting with area businesses for partnership opportunities. Such connections resulted in a 4,000-pound-capacity forktruck being donated to the mission’s food bank, 1312 West Market St., in February. The equipment was donated by Direct Forklift and Equipment Co. in Boardman after Carl Stitzel, co-owner of the company, watched a news story about Warren Family Mission. Stitzel ran a donation campaign for the mission, which prompted Mararri to reach out to thank him and let him know of the need of the organization for a forktruck. The forktruck makes things easier for volunteers at the food bank when they unload food from delivery trucks to the storage space, Mararri says. Being able to work with the mission and make things happen gives Mararri the feeling that he was looking for when he abused drugs and alcohol, he says. The mission also provides clothing and welcomes donations of all kinds, says Cait Gilger, director of development and Chris Gilger’s daughter. 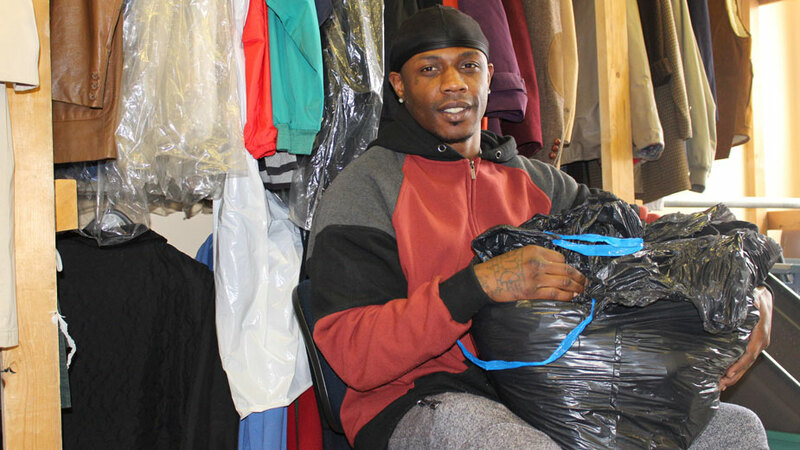 The on-site clothing room has items for adults, children and babies and is popular among people who need a new outfit for a job interview, she says. The clothing room, open Tuesday and Wednesday, serves more than 2,000 people monthly, she says. Anything that isn’t distributed is sent to relief organizations in Africa. Volunteer Daylin Brimmer sorts clothes at the Warren Family Mission. The mission distributes toys to 1,500 children at Christmastime and provides 300 baskets at Easter, she says, as well as 10 bikes during each. A $10,000 donation gave the mission a headstart this year for toys, but it’s usually short on gifts for teens, such as games, makeup for girls and cologne for boys, she says. 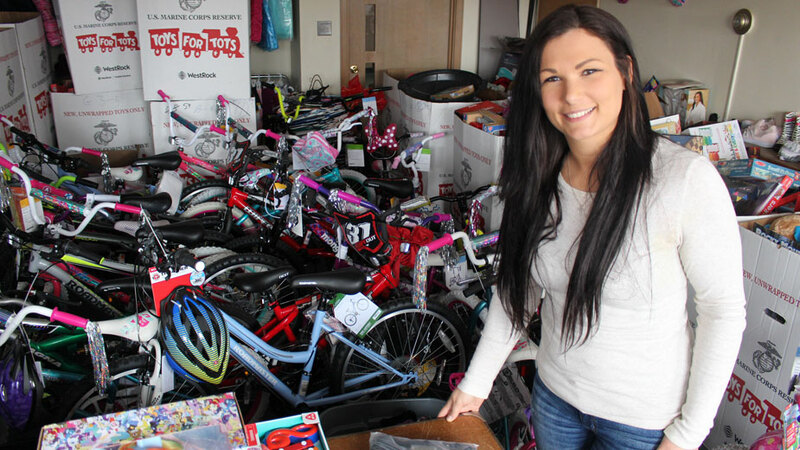 The mission hands out toys and bikes during Christmas and baskets at Easter, Cait Gilger says. With Easter around the corner, the mission is preparing for its April 19 dinner, during which it typically provides up to 3,000 hot meals, she says. Some 800 are eaten on-site while the rest are delivered to those who can’t make it to the mission. Looking toward the future, the mission is working with Trumbull County and Commissioner Dan Polivka to install a larger lift on the back of its delivery truck so it can take food to senior citizens living in some 20 high-rise apartments in the county. The need for the countywide program is “pretty strong,” Polivka says.“Some people can’t get out. They don’t have transportation,” he says. Chris Gilger hopes to secure a large concession van for hot-food deliveries, and he wants someone who can cook on-site to feed hungry residents where they live. “We want to start doing four big feeding sites around the Warren area so people don’t have to go so far,” he says. CLICK HERE to watch Chris Gilger’s 3 Minutes With interview. Community members can make a positive impact on the Warren Family Mission by making a donation or volunteering their time. The nonprofit is funded soley by donations, says its executive director, pastor Chris Gilger. Individuals can make a donation at WarrenFamilyMission.com/donate, by calling the mission at 330 394 5437, or by visiting the mission’s headquarters at 155 Tod Ave. in Warren. Clothing and food donations can be dropped off at the mission’s headquarters as well. The nonprofit also has need for trial-size personal hygiene products, new unwrapped toys and bicycles and baby items, including food, formula and diapers. A list of specific needs can be viewed at WarrenFamilyMission.com/our-needs. Volunteers can get involved by calling the mission or emailing volunteer@warrenfamilymission.com.